Color fan? YES! Sports fan? Not so much any more (I OD’ed on sports during my stint at Reebok) but this article in the Boston Globe caught my attention. Writer Jim McCabe’s inclusion of color meaning and color theory work well and I thought you might find it as interesting as I did. I pulled out the key paragraphs and pasted below but you can see the entire article titled “Baltimore’s dream is for black and blue” at boston.com. To get purple, you mix blue with red, but the citizenry here never asked for such an exercise in science to color their football passion. No, they had a primary color (blue) and a primary pro football love (the Colts), and for several generations the two went hand in hand, as perpetual as the sky and sea. Until, that is, a cold and wet spring night nearly 23 years ago when the sky fell and the seas parted and trucks sneaked into town and drove out with large chunks of their spirit. The Colts, much to their shock, had moved to Indianapolis. For the rabid football fans of this area, it was a day they will never forget. Blue has long been considered the color of stability, trust, and loyalty, but since the March night in 1984 it has represented an emotional pain that is not easily shaken. Forgive and forget? They are concepts seemingly difficult to embrace here, and this week the emotions have bubbled over and old wounds have been reopened. At the close of the article: “It would have been different, I think, if they did what the Browns did when Art [Modell] moved from Cleveland [to Baltimore in 1996]. He left the Browns logo and everything in Cleveland,” said Ogden. “[But Indianapolis] has the horseshoe and the same uniform that the people [of Baltimore] grew up with. Cleveland, they got their Browns back. “But the Baltimore football citizenry never got their Colts back — at least not in whole. 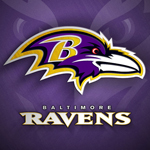 Oh, they got the Ravens, and the team has served them well and they truly love them. If you don’t think so, just tune in today and listen to a crowd of some 70,000 that is as loud as any in the NFL. They will be covered in purple, a by product of blue.